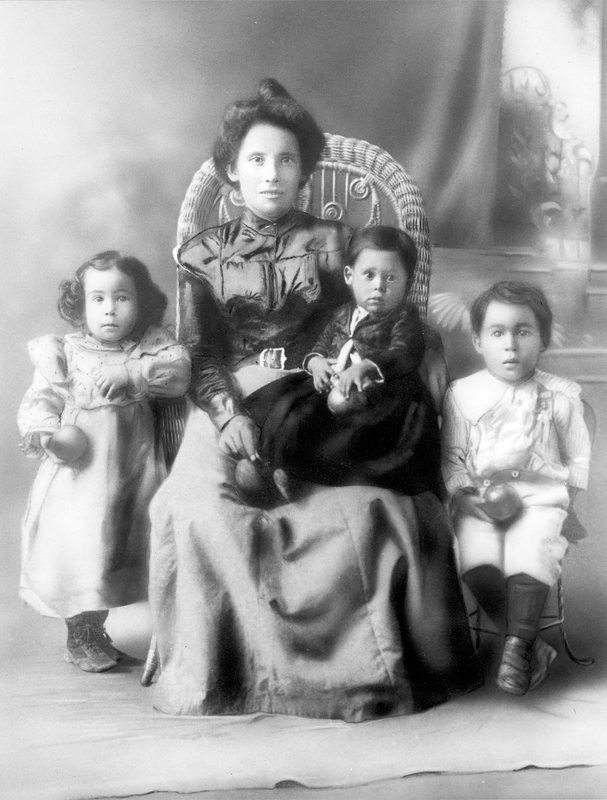 Adelaida Cuellar photographed in 1901 with three of her children. photo courtesy of D Magazine. In 1892, two young lovers crossed the border from Mexico into the United States and got married in Texas. They spoke no English but were very fluent in the language of love. They were dreamers yearning for better opportunities then their home country could provide, and they were determined to work hard to create a beautiful life that would bring them all they desired. The newlywed years of Macurio and Adelaida Cuellar led them through a myriad of jobs on ranches around the Texas countryside. 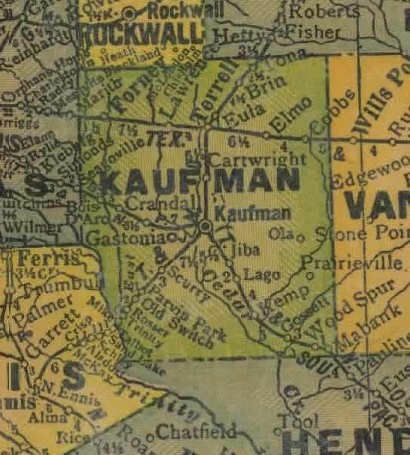 For five years they moved about before they settled down in Kaufman, Texas, a suburb of Dallas, where Macurio started sharecropping and Adelaida started a family. As the seasons passed, their family grew, eventually producing twelve babies. 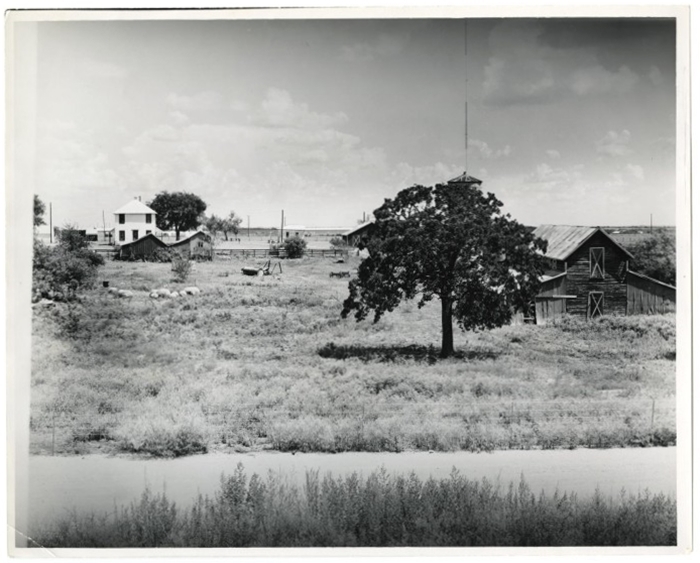 This is an unidentified farm photo from the Cuellar collection. It may have been the farm where Adelaida and Macurio raised their family. If not, it gives an interesting perspective on what farm life looks like in Texas during the time Adelaida and Macurio lived and worked there. Image courtesy of the University of North Texas Digital library. Ranch and farm work weren’t the most profitable of jobs, so Adelaida took a stall at the Kaufman County Fairgrounds in 1926 selling two things… chili and tamales. It was her hope that her homemade recipes, so loved by her family, would bring in a little extra income to help support her children. To her surprise, the food stand was an instant success. The profits she made from her entrepreneurial endeavor were much larger than farm or ranch work earnings, so Adelaida kept at it, turning her stall into a tidy little family business. Some of her children helped her cook while others formed a family band playing Mexican music to entertain the eaters. 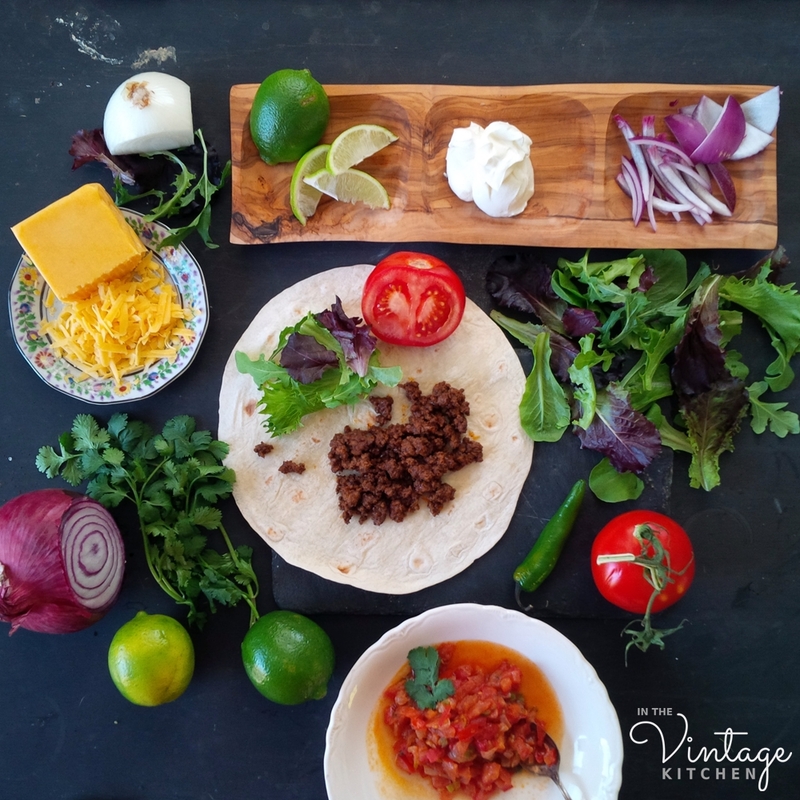 During the 1920’s, Tex-Mex cuisine was a new style of cooking that combined traditional recipes from Mexico and Spain but with toned down spice factors which were more appealing to American palates. Adelaida’s chili and tamales debuted at just the right time – exotic enough for adventurous eaters and flavorful enough without being too spicy to dissuade repeat business. With every taste of tamale and every cup of chili, Adelaida’s reputation for preparing delicious Mexican food began growing. 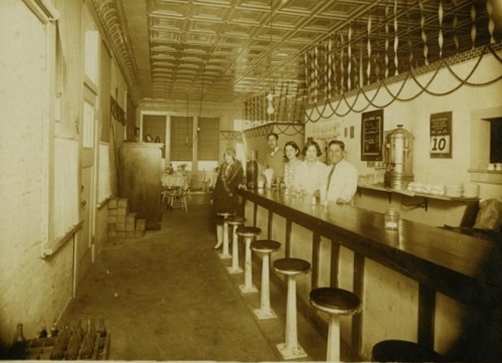 Adelaida’s Cafe – simply called Cuellar Cafe – opened in 1928. Image courtesy of the University of North Texas Digital library. In her mid-fifties, Adelaida opened her own restaurant which did well until the Great Depression hit and she was forced to close due to the terrible economy. Each of her grown boys inspired by their mother’s own entrepreneurial spirit opened their own independent Mexican restaurants in different cities throughout Texas, Oklahoma and Louisiana using the recipes that Adelaida made for them growing up. Each of the sons, enamored with cooking just like their mom, quickly realized there was something missing from their independent ventures… family love and support. From the beginning, in the county fairground days, the Cuellar family was successful at the tamale and chili stand because they all worked together towards one common goal. But now the family was spread over many cities, and their restaurants couldn’t be as successful because they all weren’t working together. This is one of the original porcelain neon signs from the first El Chico restaurant in Dallas. It’s now for sale on ebay here. 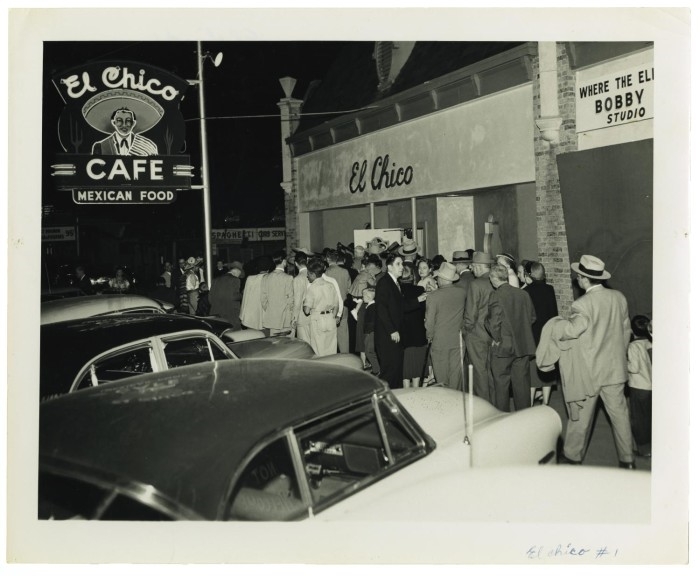 So in 1940, five of the brothers banded together to form one restaurant in Dallas, which they named El Chico. The entire family and extended family worked there together, each bringing their own unique talents. 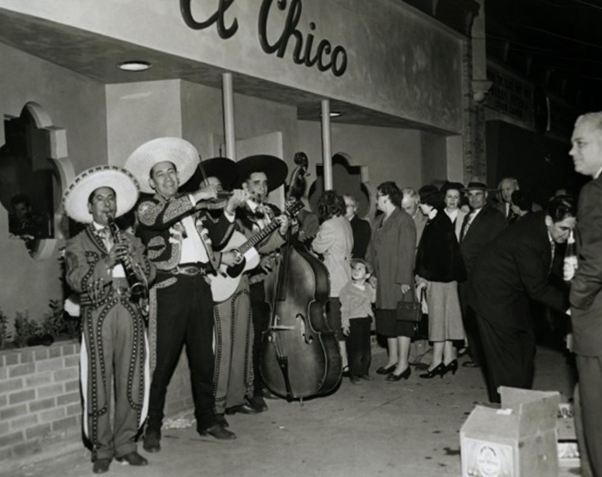 Opening night of El Chico featured a Mariachi band to entertain the crowd. 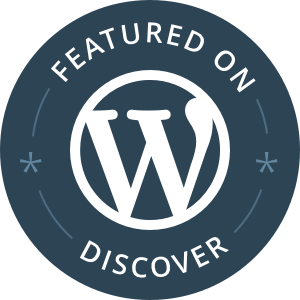 Image courtesy of the University of North Texas Digital library. Everyone who worked at the restaurant was fluent in Adelaida’s style of perfection when it came to selecting quality ingredients and blending the spice mixtures in the correct way, so the food was authentic and consistent, which kept customers coming back. And the Cuellar family was proud of what they were accomplishing. At the heart of their restaurant lay the heart of Adelaida and all that she stood for. Her children wanted to extend that same level of love and devotion with all who dined at El Chico. A popular dining place indeed! This photo was taken in 1945. Image courtesy of the University of North Texas Digital library. 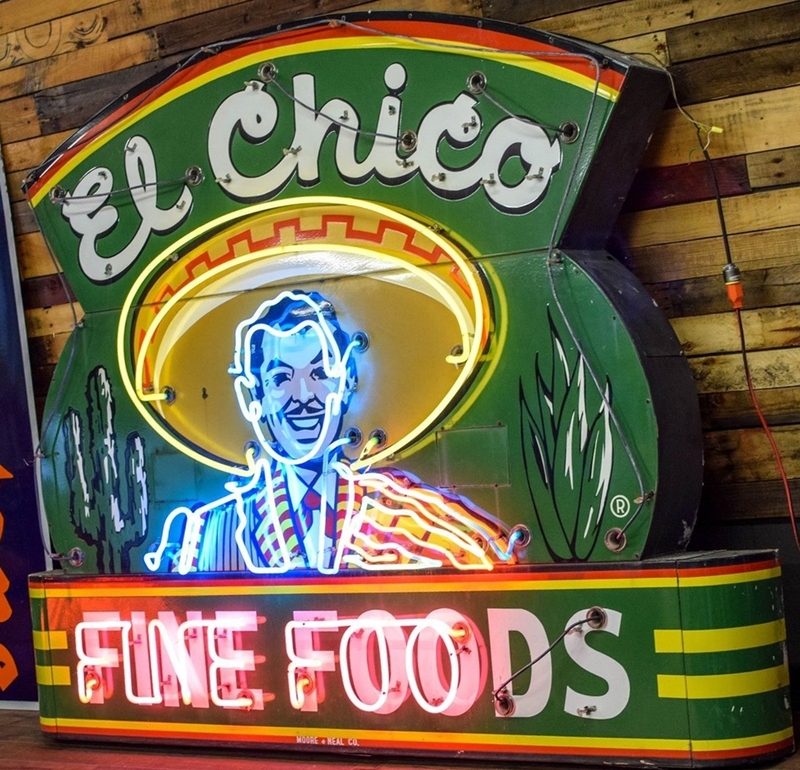 Just like Adelaida’s chili and tamale stand, El Chico became phenomenally successful, making the Cuellar family and the El Chico brand one of the greatest American success stories. They went on to open more than 40 restaurants throughout the country, built a successful packaged food division for the retail market, and offered franchise opportunities for budding entrepreneurs. By the 1970s, they were the largest full-service Mexican food company in the world. They cooked for United States presidents at the White House, for princess Grace Kelly at her palace in Monaco and entertained movie stars like John Wayne in Dallas. The family stayed together through all these years and all this growth, never veering from what they knew – good food taught to them by Adelaida. 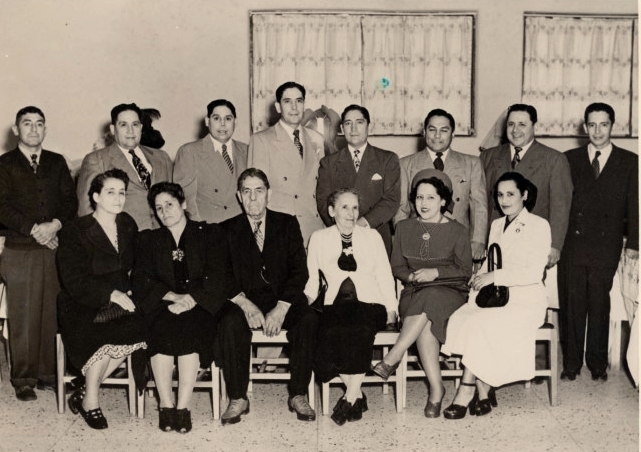 A Cuellar family portrait with Adelaida and Macurio in the front row center. Image courtesy of the University of North Texas Digital library. Adelaida passed away in 1969 at the age of 97, not before experiencing the overwhelming success of her family and seeing how her humble tamale and chili stand at the Kaufman County fairgrounds grew into a multi-million dollar corporation over the course of forty years. The Cuellar children credit both their mom and their dad with teaching them about the value of working hard (and quickly) toward their goals and the importance of taking chances. In 1970, El Chico published a small, spiral bound cookbook of some of the family recipes that they used in the restaurant, along with some others collected from their travels. Hailed as one of the most authentic Tex-Mex cookbooks ever published, it’s now a hard-to-find treasure. It is in fact, so special and represents such an importantand integral part of the ethnic American food landscape, that it’s held in special collection at the Smithsonian’s National Museum of American History. 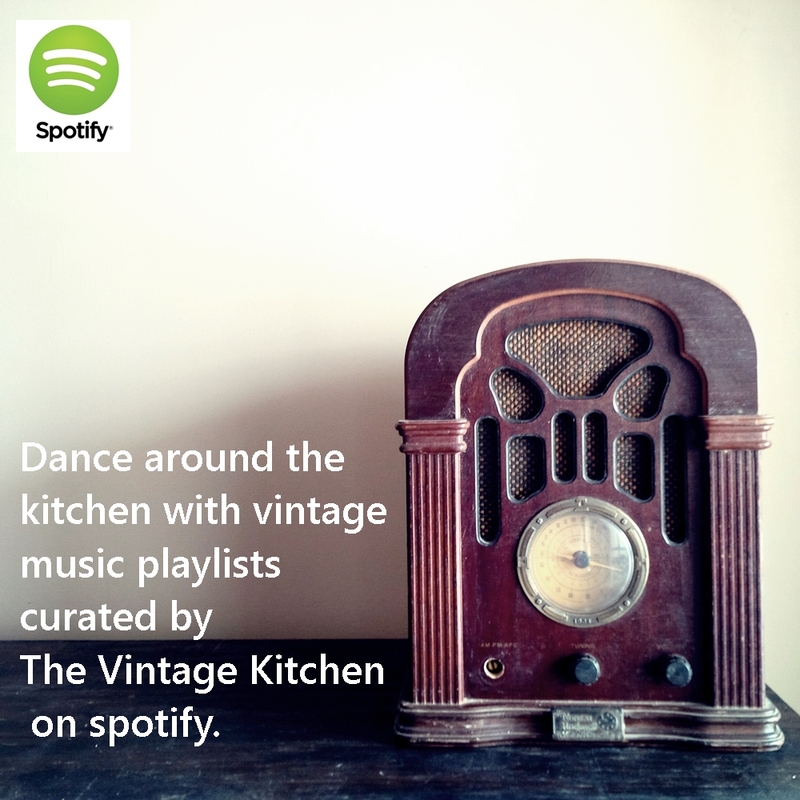 We are also very pleased to offer a copy in the kitchen shop. 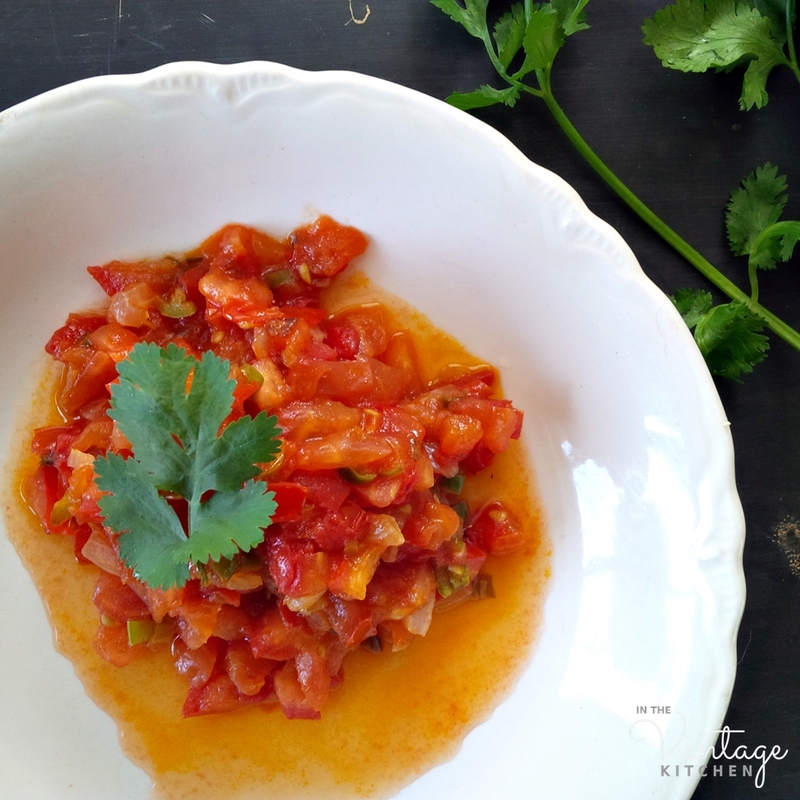 Since Cinco de Mayo is coming up this Saturday, on the same day as the Kentucky Derby, we thought it would fun to highlight two vintage recipes from the El Chico cookbook to ring in the festivities. A general crowdpleaser with a ton of creative toppings, these recipes are fun party foods so whether you are celebrating Mexico or Kentucky, or both this weekend, there will be something edible for everyone. On the menu it’s El Chico’s Homemade Beef Burritos & Ranchera Sauce. Both are really easy to make. You’ll have the whole thing whipped up in under 30 minutes. 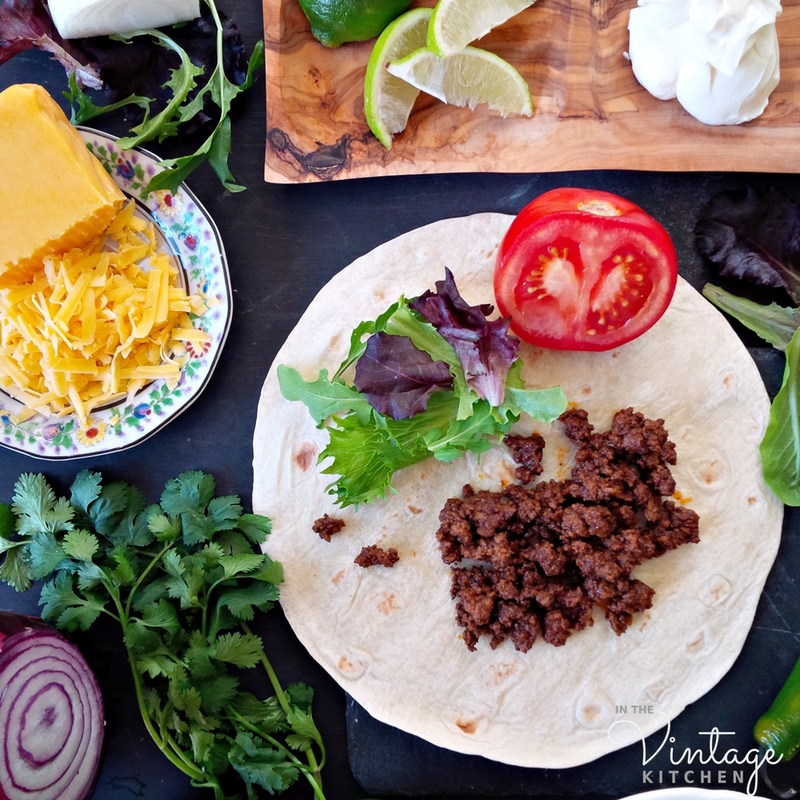 Each recipe features fresh ingredients with generous amounts of spices, so you can skip buying the taco seasoning packages and the taco sauce at the grocery store. There’s plenty of flavor between the two recipes. 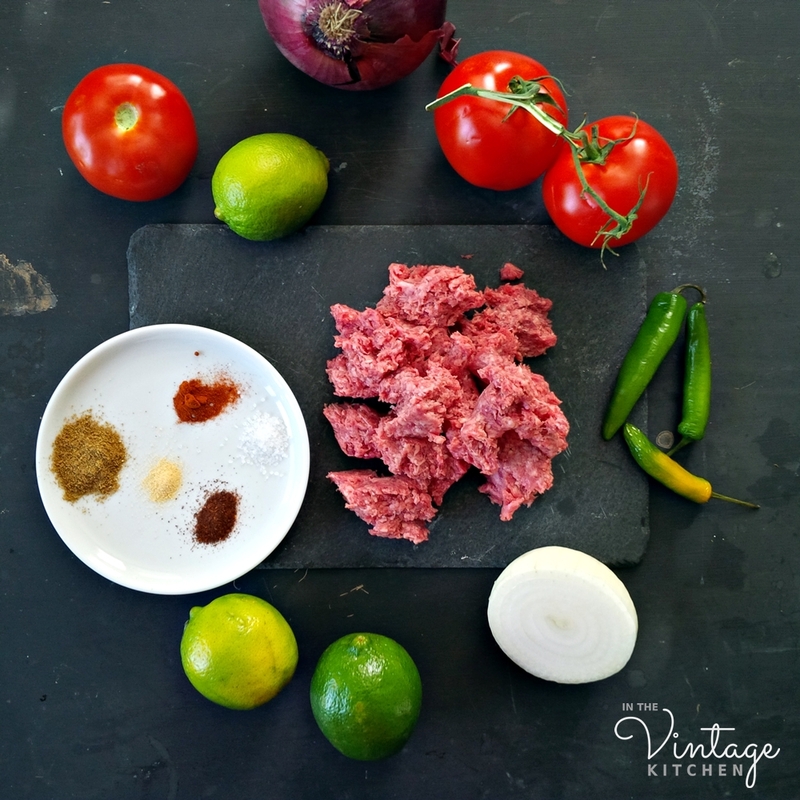 In addition to ground beef, you could also incorporate ground pork, turkey or chicken if you wanted to offer multiple variations. 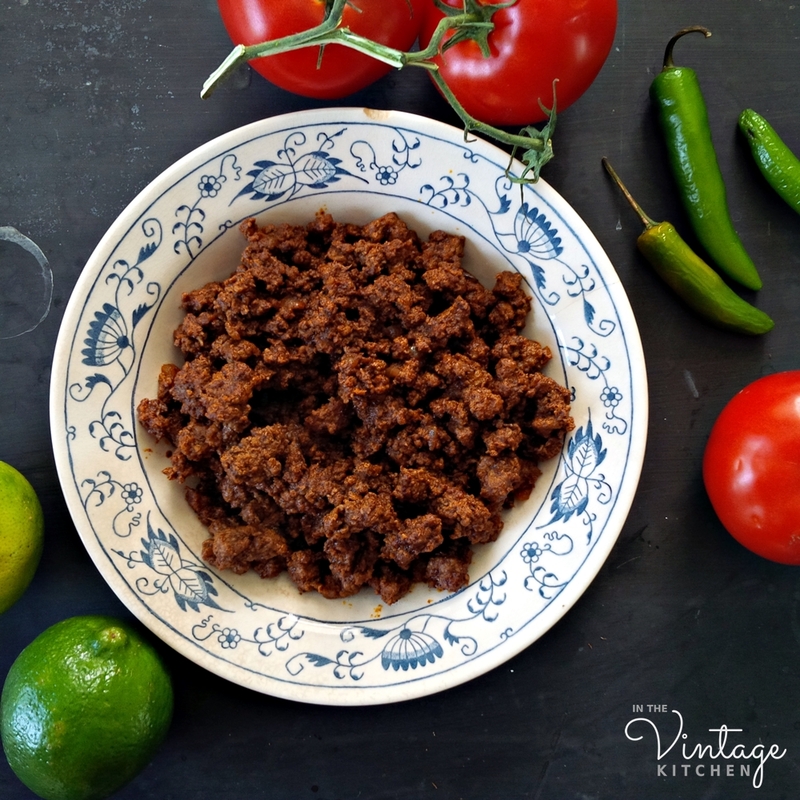 What’s especially great about the Carne Mexicano recipe is that it includes vinegar which gives it a little bit of tang and de-greases the pan all at once so you don’t need a thickening agent like cornstarch or flour which is included in most commercial taco seasoning packets. As with many vintage recipes, we cut down the salt by 2/3rds, so we recommend starting with our measurement first and adding more to taste if you feel it needs it. In a cast-iron pan over medium-high heat brown the beef and onions until cooked through. Add the spices and cook for 1-2 more minutes. Add the vinegar, scraping the bottom of the pan to deglaze it. Remove from heat and serve immediately or store mixture in a covered dish and keep warm until ready to serve. Saute the onions and peppers in shortening (or olive oil). When the onions are translucent add the tomatoes and simmer over a low fire for five minutes. Serve it immediately or at room temperature. Obviously, the hotter your peppers, the spicer your sauce is going to be. This recipe makes about 1/2 cup of sauce so if you are cooking for a crowd you might want to double or triple the recipe. We used serrano peppers which were quite hot so a little bit spooned on top of your Carne Mexicano goes a long way! There are so many topping options when it comes to burritos, so your creativity can really shine here based on your preferences. El Chico suggested that their burritos include only cheese, refried beans, Carne Mexicana and the Ranchero Sauce. But we added a bunch of our favorite toppings too which included sour cream, spring lettuce, red onion, mango, tomato, cilantro, avocado and lime juice. Other possibilities re guacamole, green olives, rice, etc etc. The sky is the limit. Can your burrito ever really have too much stuff? Coming up tomorrow on the blog, we’ll be sharing our picks for the Kentucky Derby winner, as well as our table decorations for the Derby Party, which tie together both the Mexican theme and the horse theme. 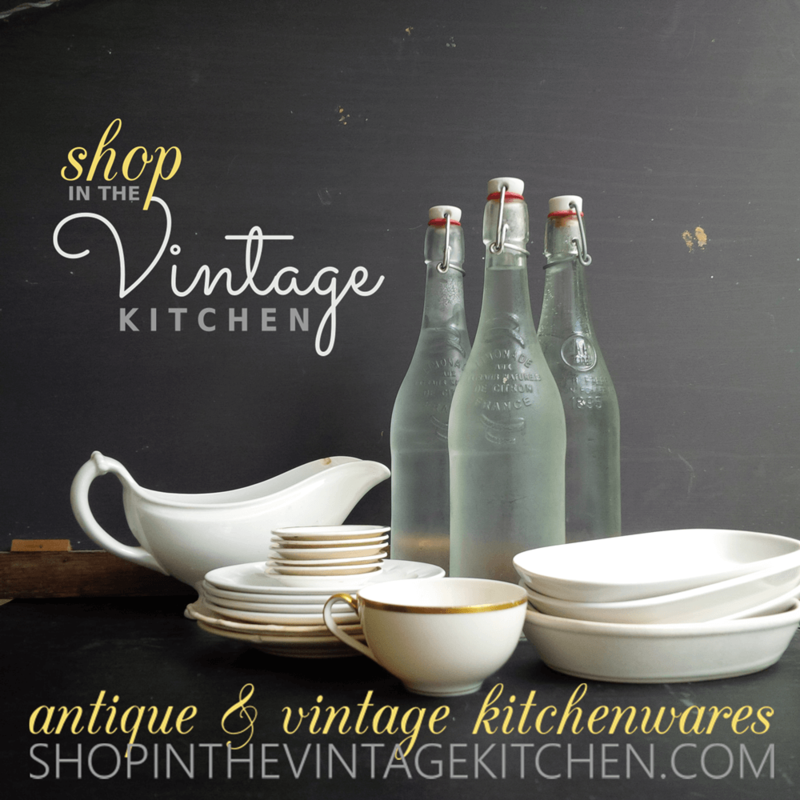 If you are planning a party for either event, we’d love to hear how you are celebrating. In the meantime, cheers to Adelaida and the Cuellar family for sharing their long-time favorite family recipes with all of us. We will definitely be sending a toast their way on Saturday! Explore more information about the El Chico cookbook here. And learn more about the restaurant chain, still in operation, here. Previous We Have A Winner! The recipe looks great as well. We have very few Mexican restaurants here. What a fun cooking adventure that will be! If you don’t have access to soft tortillas let me know and I’ll send along the recipe on how to make those from scratch as well. We had such a challenge deciding on which recipes to feature from this cookbook. They all sounded so delish! Happy burrito making!